The Christ Church Camerata is the leading classical music ensemble of Australia’s Hunter Valley. Named after Newcastle’s iconic Christ Church Cathedral, where it is based, the Camerata’s performances range from concerts of chamber music to string orchestra concerts. 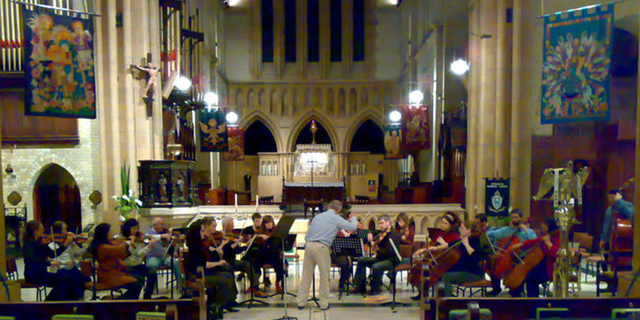 In 2012 the Camerata released its first CD, Serenade for Strings, on the Chartreuse label. The CCC’s Artistic Director is David Banney, and the orchestra has been conducted by distinguished international conductors Géza Szilvay and Johannes Fritzsch. The CCC has been heard on ABC Classic FM in recordings and a live broadcast, and has worked with a number of prominent soloists including pianist Roger Woodward, violinist Susan Collins and flautist Sally Walker.